For those who haven't been closely following the development of Star Citizen lately, there have been a few interesting announcements on the project's financials and upcoming plans. Cloud Imperium recently released an accounting document that details out how the company used its money form 2012 through 2017. They spent $193 million on development and other expenses during that time with more than $4 million per month going out in 2017. We know they hit $200 million in crowd funding in November, but they also have other resources such as $46 million in private investment raised in December. 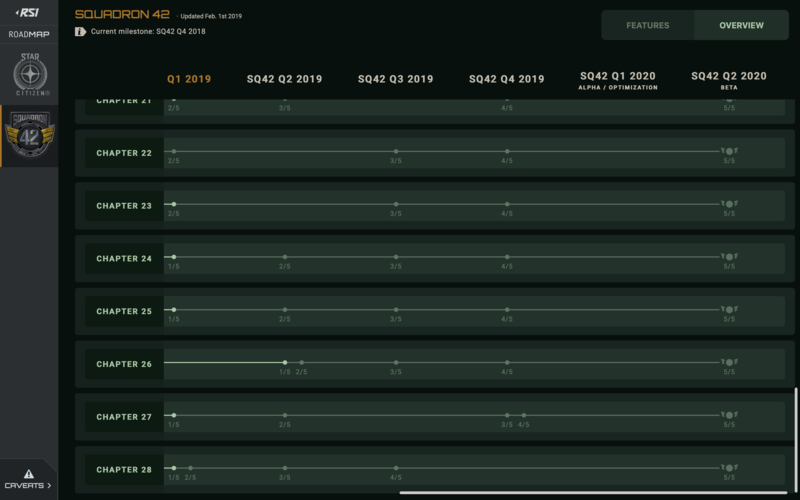 The most visible development lately has been to bolster the game's persistent universe and core technology, but a roadmap to Squadron 42 has also been released. This is the single player campaign starring Mark Hamill and John Rhys-Davies, among others, which many Wing Commander fans have been waiting for. New details outline a number of milestones for this year with a target for achieving beta status in the second quarter of 2020. Lastly, we have a blast from the distant past. 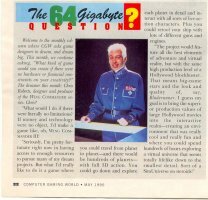 Here's a snippet from a May 1995 article that challenged Chris Roberts to dream up his ultimate video game if there were no technological or financial constraints. Here's what he said! What would I do if there were literally no limitations? 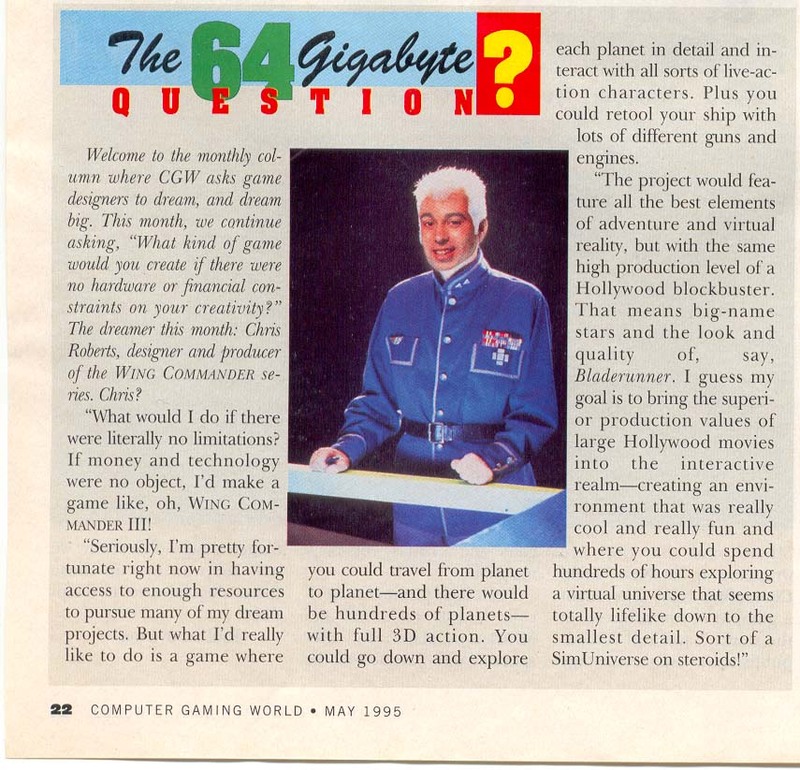 If money and technology were no object, I'd make a game like, oh, Wing Commander III! Seriously, I'm pretty fortunate right now in having access to enough resources to pursue many of my dream projects. But what I'd really like to do is a game where you could travel from planet to planet - and there would be hundreds of planets - with full 3D action. You could go down and explore each planet in detail and interact with all sorts of live-action characters. Plus, you could retool your ship with lots of different guns and engines. The project would feature all the best elements of adventure and virtual reality, but with the same high production level of a Hollywood blockbuster. That means big-name stars and the look and quality of, say, Bladerunner. I guess my goal is to bring the superior production values of large Hollywood movies into the interactive realm - creating an environment that was really cool and really fun and where you could spend hundreds of hours exploring a virtual universe that seems totally lifelike down to the smallest detail. Sort of a SimUniverse on steroids! From the start I, and many others had the idea(I think there was even hinted at it) that Squadron 42 would be a co-op campaign.. sometime later there was the mention that some missions could be re-played in co-op after completing the campaign.. now there is no co-op at all? Yeah, feature creep killed this game for me. Considering it was in development before it was shown, it has taken them around 9 years to get this far... Roberts better hope he can deliver, or you'll have pissed off nerds with thousands of dollars to spare coming for his financial head. I can see this going really, really bad. Or the opposite. I'm reserving my judgement till about 2022 If I'm still around. Out of morbid curiosity, I wonder how many of the original backers have died off and never got to see the game they originally backed because it exploded into this monstrosity. One thing is sure! "Time passes waaay too fast!" I'm being a bit silly here, mind you, so don't take me too seriously, but - I was totally disinterested in Star Citizen before all you cool kids were being disinterested . Now, to be serious: is feature creep killing the project? Has it been going too long? Well, in the same way that I get pissed off when non-Catholics complain about how the Church uses collection plate money that they never contributed to, I feel - I know - I don't have any right to complain about Star Citizen, when I haven't put down a cent for it. As far as I can tell, it seems that most Star Citizen backers are satisfied with how the project is going, so more power to them - and I sincerely wish everyone ultimately is satisfied with the end results. Granted, I did feel a bit silly last year, when I showed my students a "making of" video for SQ42's cutscenes, and it suddenly hit me that this was the fourth year I was showing the same video, and still no one had any real idea when SQ42 would be released. 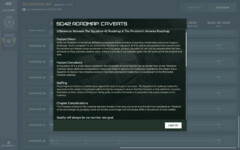 This I found disturbing and surprising, because Star Citizen as a complete package is one thing, whereas SQ42 is supposed to be, you know, just Wing Commander 7. But, again, I didn't put down any money, so I have no right to complain. As for why I've never been interested in Star Citizen - well, as I've said before, I'm waiting for Wing Commander, and I'm not really very interested in other sci-fi universes. I have the same problem with fantasy games, too - there's half a dozen open-world RPGs sitting on my Steam account, which I should be really excited about, both as fan of the genre, and as someone who's spent considerable time studying the genre for my PhD... but I just can't get excited about them, because I don't feel like I have the capacity to dive into yet another fantasy universe. As these worlds get deeper and broader and more sophisticated, you realise there's a limit to how many worlds you can track at once, and therefore - how many you can love. It's a matter of time and mental capacity. My general point of view of things is this. Nature and the way this universe works, I mean the real one, has limits. Always did and always will. I am sorry for the exaggeration, I just wanted to promote my logic here! For myself and many more here Robers is the JFK of the genre. His funding is more than enough plus that he hasn't EA or MS above his head to change his vision or plans. I am not saying that having bakers over you is better but as far as the project management is his, he gives the signal. Does S42 needs more time to develop from Apollo 11? ps. I believe with all my heart, that the development of a software never ends. I am not talking about StarCitizen and it's future features or capabilities, I am talking about Squadron 42! For a modicum of positivity on this thread, I'll say that I still have faith that Star Citizen and Squadron 42 will ultimately be everything I was expecting. Since what I was expecting was the need to seriously upgrade my home gaming desktop, and I still haven't been able to upgrade my box (still using the same one which was horribly out of date to begin with when the project was first announced, because kids = lack of funding as a general modus operandi), I doubt very much I'll be disappointed. As a side note to this thread, I'm now happier than ever that I never had kids. Ditto here - I was a year away from getting engaged when we went to Austin for the Star Citizen reveal... and we waited a while after getting married to get pregnant, and now we have two kids. 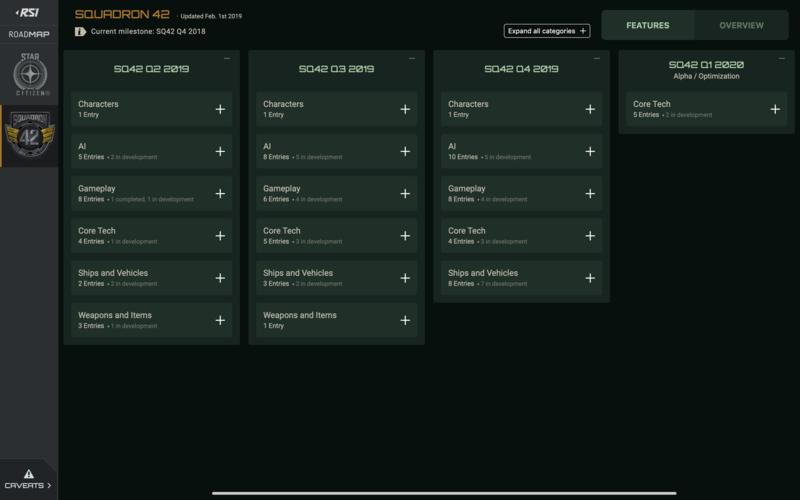 For another time comparison, about the time that the current roadmap predicts that Squadron 42 will hit beta, it will have been in development for the same amount of time as Wing Commander 1 through Secret Ops. It seems likely that it will be in development for longer than the entire Wing Commander series was on PC. Everyone makes EA out as the bad guy (while forgetting that's what made the incredible production values of WC3/4 possible) for forcing its developers to pump out games at a steady clip, but there's something to be said for deadlines. They really force you to focus on a target and figure out what it takes to finish. As for me personally, I'd love to play Squadron 42, but it has to be on Xbox. Back in 2012, Chris Roberts said his vision (which would take a couple years to fulfill) could only be achieved on PC. We're now two generations of Xbox later, and the graphic power possible on consoles now exceeds what PCs could do back then. He's got half a dozen studios doing different parts of the game. Once they get it done, they just need to get another developer to port it (with coop, of course). If only the console version gets multiplayer.. He is shooting himself in the foot with the PC version.. And then I would need to buy a new, licensed XBONE HOTAS..
Purely from a consumer perspective, EA in the 90s is a different beast from EA today. EA today wants you to pay full price for a game, then several times on the back-end because "service". Any publicly traded company will fleece you for every dime they can though, because people have no integrity and they have to make "all of the money." Needless to say after Dragon Age Inquisition, I'm not buying another EA game. I'm staying away from all online games that include any micro-transactions as well. I'd much rather pay a subscription than be a second class citizen because I didn't pump thousands of hours or dollars into a game. I did back SC, but their business model so far leaves much to be desired. It's almost disgusting tbh. It might be a strange thing to say, but I'm quite happy to find that other people are upset that S42 coop got dropped. It was one of the aspects I was most excited about personally... I'm all about coop generally - there are far too few new coop games on PC these days. Good mission-driven space combat games with coop? Ridiculously rare. It seems a lot of devs drop it since it doesn't gel with their lore/immersion/whatever. Bah! Give me (classic) Doom-style coop. One "lone marine" with up to three "lone marine" buddies, immersion be damned. So much fun, so many memories. Yeah, for comparison, Wing Commander Armada in 1994 and Starlancer in 1999 both had online coop. Starlancer would even do multiplatform multiplayer between both the PC and Dreamcast - twenty years ago! Seems like a feature you can't leave out. Think about some of the most famous coop games in history, Halo for instance, and they just merely duplicated the main character so you had two Master Chiefs running around side by side. And I wouldn't even think that's the case here. Space sims are especially suited for coop because you just add more people to your wing and fill out the fighter squadron that goes on a mission together. Just scale the difficulty accordingly, if necessary (and if that's too hard, and the game is just easier with two people, so what?). I must say - i don't belive EA would make any Wing Commander in the future. They sitting on much better saled IPs. Star Wars and Mass Effect. Would make Star Citizen sense on Consoles? No - the patch politic of M$ and $ony would cost for 10 Patches already 1.5 Million Dollar. In a Game over 10 years and several Patches without getting Money for it - 15-20 Million taxed alone for Patches in that years? No. And look at Elite Dangerous. Console versions sold around 1 Million copys - for both consoles PS4 and Xone. Overall E-D have 3.5 Million copys sold - so About 2.5 Million PC copys. 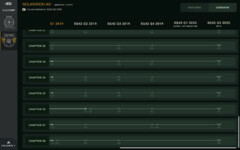 Star Citizen is more complex with those item System - Size 1-4, Military, Stealth, Civilian, Industrial, Competition, Grade A-D Components, Balistics, Laser, Distrupter, Beams, Repeater, Canon or? Thats so many Things a typical console Player is Overwhelmed. CoD Infinite Warfare is easy to understand - but also known as the most hated CoD Part. Maybe CIG Change the mind and make Squadron 42 on consoles. But for how many Players? 500k? Don't get me wrong - more Players - more Money to Finance the game. But I see so many Problems - Control also - you Need Mouse/Gamepad/Joystick AND Keyboard for all those commands. I Play with Joystick Space, Mouse FPS and Need in both also the Keyboard. I payed meanwhile a lot in Star Citizen Oo Start with my Colonel Hornet Package and sure not end here. Not far away from Space Marshall - 5k Dollars Spend Oo - Carrack and Vabguard Harbinger this year - still waiting for the Polaris Corvette. Would make Star Citizen sense on Consoles? No - the patch politic of M$ and $ony would cost for 10 Patches already 1.5 Million Dollar. In a Game over 10 years and several Patches without getting Money for it - 15-20 Million taxed alone for Patches in that years? No. The scandal was about low five figure fees, and that scandal was in 2012. The fees were discontinued more than five years ago as the gaming industry evolved. Not an issue. 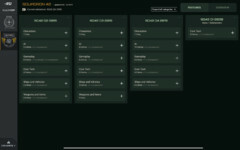 Star Citizen is more complex with those item System - Size 1-4, Military, Stealth, Civilian, Industrial, Competition, Grade A-D Components, Balistics, Laser, Distrupter, Beams, Repeater, Canon or? Thats so many Things a typical console Player is Overwhelmed. Ehh, that's just ridiculously petty. Playing video games on a PC doesn't make you smarter than people who play on consoles, mobiles games or anything else. I could just as easily throw out the statement that most console players are former PC players that are sick of dealing with inane technical problems just so they can play hunched over a tiny screen. Yeah, both Playstation and Xbox support mouse and keyboard now for games and whatever other accessory you could possibly want. Not an issue. I will agree with Chris on this Deathsnake. From the developers perspective, it is unacceptable to create a project of that magnitude and not making it cross-platform, trust me I know it is hard in the whole line of process (development, debugging, distribution etc...) but it has to be done, been there. During the 80s-90s my father could spent up to 100 dollars for a video game once or two in the year. I recall MS Flight Simulator being the most expensive one but with that prices we were able to play all the Wing Commander games and being here with you, create even fan games for it. What can I get with 120 dollars on Star Citizen? And If I get something do I get a complete experience? The average yearly salary in Greece is about 10,500euros. If I want, as a Greek, to compete you on StarCitizen I have to find a better job? If SC is a product for hobbyists only, I can accept everything of the above. I can't see the appeal of it on console, it was pitched as the return of space combat, on PC. That was the hook. I play everything new with a gamepad, but that's because titles are made with console in mind and PC an afterthought. I've lost a lot of enthusiasm for SC but that which I do have is centered around that original stated goal. I do think complexity is an issue; and that's the default input method. When you've got to think about gamepad controls you aim to keep it simple, nothing to do with the target audience players; just the interface. Wing Commander was tough enough, from comms to power management. Now fortunately the ports came after, it didn't interfere with the original game, no issue with it - just I'd expect old school space combat fans to be as meh about the idea as playing WC SNES vs PC. And I will say these days PCs are plug and play, all driver updates are automated, no messing around with boot-disks, heck nVidia like to tell you what settings to put all your games on. One click and it configures every game you own. Now that MS put all their big releases on windows too I haven't turned on the XBox in years. PS4 has enough exclusives that I still use it, but if I want to play in the living room with a gamepad I just stream it over. Steams big picture mode is if anything easier to navigate than the main consoles.